Of the plug-in electric blowers available, the Toro 51619 Ultra Blower Vac (Est. $85) looks to be a top choice. It earns a Recommendation from ConsumerReports.org, and while it's a runner up to a different corded blower at TheSweethome.com (discussed below), it still impresses reviewers sufficiently to be called a "good alternative." The Toro Ultra Blower Vac is feature packed. It has a powerful 12-amp motor; converts to a vacuum in seconds and without needing tools; and has a new, larger metal impeller that finely mulches, reducing debris volume by 88 percent. The variable speed control lets you choose the right power for every task. The vacuum bag doubles as a storage bag; you can pack everything inside and hang it on a wall. Its air flow is rated at 250 mph, and its air volume at 410 cfm. In expert testing at ConsumerReports.org, it earns the highest possible ratings for sweeping, loosening and vacuuming of debris. Noise levels are low enough that it won't overly annoy neighbors (assuming responsible use), but still loud enough that ear protection is advisable. User feedback is strong for the Toro 51619. While some of the reviews originate at the manufacturer's site and others (due to their age) are clearly reviews of earlier blowers, we see more than 1,650 posted at HomeDepot.com, and an overall rating of 4.3 stars. Amazon.com mingles the feedback for several similar blowers together, but the 51619 draws more than 1,050 reviews and largely positive ratings (roughly 87 percent of these are 4 stars or, mostly, 5 stars). Among other corded-electric leaf blowers, the Worx WG520 (Est. $55) looks to be a strong choice if your budget is a concern, and perhaps the best choice overall if you don't need the ability to mulch and vacuum debris. Indeed, those missing capabilities are just about all that kept us from elevating this Worx blower to top status in this category. That reduced versatility can be a big deal to many homeowners, though many others might not care. If you fall into the latter group, give the Worx serious consideration. Feedback for the Worx thus far is excellent. It earns a recommendation from ConsumerReports.org, and Best Buy status. It's also the top choice at TheSweethome.com. There, reviewer Doug Mahoney says "In our three years of leaf blower testing, the Worx is the most powerful electric blower that we've used. In fact it's more powerful than a lot of the gas blowers we've used." The Worx WG520 is rated at a maximum air speed of 110 MPH and a maximum air volume of 600 CFM. All testers find it to be a top performer when sweeping clippings, etc., though we found a little bit of divergence when it came to how effective the WG520 is in loosening debris. ConsumerReports.org finds it to be very good, but a notch below the Toro in that regard, but TheSweethome.com begs to differ. "Compared with the others we tested, it has the most powerful airstream, and showed no problems getting under the bed of thick, damp, matted leaves and pine needles on the forest floor," Mahoney says. Another plus, at less than 6.5 pounds it was around two pounds lighter than the next lightest corded blower TheSweethome.com tests, and, as you would expect, several pounds lighter than gas blowers. Finally, it's relatively quiet -- more so than the Toro -- and ConsumerReports.org comments that hearing protection isn't needed when using this blower. Users seem to be thrilled thus far as well. We found hundreds of them scattered across sites such as Amazon.com, HomeDepot.com and elsewhere. As an example, the Worx WG520 earns a rating of 4.9 stars based on more than 175 reviews that can be seen at HomeDepot.com (thought that includes some reviews originally posted at the maker's web site), and recommendations from 99 percent of owners. Cordless blowers are very convenient, and some hold their own alongside corded and even gas-powered blowers. However, the cost of their rechargeable batteries drives their cost up compared to corded electric blowers. Among cordless leaf blowers, the EGO name consistently bubbles up to the top in reviews. For this year, we are going to nominate the EGO LB5302 (Est. $180) for the top spot among cordless electric blowers. It's a more powerful version of the still available EGO LB4801 (Est. $175) that we had as our top pick last year. The LB4801 is still a reasonable choice, and remains very well liked among experts and reviewers, but unless you are pinned against your budget ceiling, the extra oomph and increased run time per charge of the LB5302 make its small upcharge worthwhile in our opinion. Experts generally give the EGO LB5302 top marks. It's the highest rated battery-powered leaf blower at ConsumerReports.org, and is also named a Best Buy. Like most battery units, there's no vacuum or mulch function, but it earns top marks in sweeping and loosening of debris. It's also the top battery model at TheSweethome.com. With it set to its maximum power, but without using the extra blast of power that the unit's turbo mode provides (see below), "The Ego's 20-minute run time is on par with blowers that typically cost $100 more," Mahoney says. ProToolReviews.com says this about the more powerful version: "Basically, EGO took an already great product and ramped it up into something even better." Calling it a "cordless beast," Clint DeBoer adds that it "looks cooler, blows harder, and runs longer than its predecessorÉand we loved its predecessor." Rated at 100 MPH and 530 CFM, the EGO LB5302's leaf-moving abilities are impressive for a battery-powered model, Mahoney notes. "Though not as aggressive as the corded Worx, the Ego had no problems lifting and pushing piles of damp, matted leaves," he adds. In addition, a Turbo mode can add an extra blast of power for tough jobs -- though at the cost of run time. "It only took us eight and a half minutes to drain the battery in turbo mode, so it's a feature you want to use sparingly." Of course, that's the correct way to use that setting. "Landscaping Pros know that you don't need to use full power 100% of the time to get the job done—most of the time Low or Medium speeds will suffice for blowers and trimmers, says DeBoer. "In fact, when you're blowing dry leaves and such, running this tool in Turbo is going to be detrimental—you'll throw up debris everywhere." Maximum run time at low speed for the EGO LB5302 is rated at 75 minutes. No expert that we consulted tests that claim, but DeBoer says "I have no reason to doubt that given the numbers and what I observed from it in higher speeds." If you do need longer run times, the batteries are swappable, so you could have a spare EGO BA14000 56-Volt 2.5 Ah Battery (Est. $150) charged up and ready to go to cover a larger property. 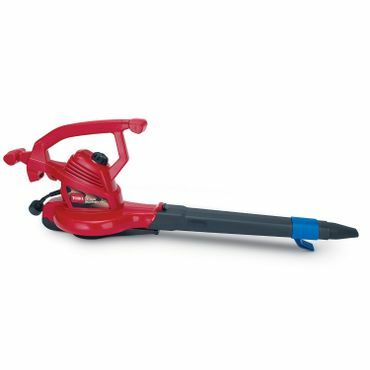 On the other side of the coin, the EGO leaf blower uses the same batteries as other gardening gear from the company, and the line includes a lawn mower, hedge trimmer, chainsaw and more (and some EGO products are reviewed in those reports as well). If you already own other EGO gear (and presumably a battery and charger for those), the blower minus the battery is available as the EGO LB5300 (Est. $120). One plus with this leaf blower is noise -- and that can be a major plus for those nearby neighbors. The EGO is earns an Excellent score for noise at 50 feet in testing by ConsumerReport.org, and good enough at the ear that hearing protection isn't really needed the expert there say -- a rarity among leaf blowers. User feedback is exceptional. We saw roughly 1,350 reviews at HomeDepot.com (the primary retailer for EGO leaf blowers) for the EGO LB5302, and it earns a 4.7-star rating, with recommendations from 95 percent of owners. The WG591 uses a 56-volt Li-ion battery system, and carries an air speed rating of 125 mph, but a lower air volume rating (compared to the EGO) of 465 cfm. Popular Mechanics grouses a little bit about the control system -- "We prefer to control blower output with the trigger, rather than the separate adjuster the Worx uses, which sometimes needed to be switched off before the blower would turn on" -- but is otherwise impressed. "We used the Worx to clean up what other blowers left behind," Roy Berendsohn and James Schadewald say. No concerns are voiced regarding too-short run times in any mode. Like most cordless leaf blowers -- at least those with much in the way of positive expert feedback -- neither the EGO nor the Worx has a vacuum function. If that's a must, the Black & Decker LSWV36 40V Lithium Sweeper/Vacuum (Est. $90) may be worth considering. That price includes a rechargeable Black & Decker LBXR36 40-Volt Lithium Ion Battery (Est. $100), which is shared by a host of other Black & Decker garden equipment, including a mower, hedge trimmer, string trimmer and chain saw. If you already have compatible gear, and the battery, the blower is available separately as well as the Black & Decker LSWV36B (Est. $70) -- though given the relative price of the battery and the bare tool, it would seem to make the most sense to get both together and spring for the LSWV36. The Black & Decker Sweeper/Vacuum isn't intended for heavy duty tasks, and those who keep that in mind are generally satisfied. With a maximum air speed of 120 mph and air volume of 90 cfm, it's only suitable for removing debris from hard surfaces, such as driveways, walkways and decks. It has a no-slip grip and a built-in scraper for loosening stuck-on debris. It converts easily from blower to vacuum and can mulch six bags of debris down to one. The model has a run time of 30 minutes when set on the lowest speed (10 to 15 minutes on the highest setting) and comes with a three-year warranty. The Black & Decker Sweeper/Vacuum (both with and without the battery) gets a rating of 3.6 out of 5 stars based on nearly 1,000 reviews posted at Amazon.com. Owners say its durability, blower performance and vacuum-mulch kit make it a great value. Many negative reviews are from those who complain that it won't handle tougher jobs or clean up lawns -- but then again, that's not what this blower/vac is designed to do. Feedback is slightly better at HomeDepot.com, though that's based on fewer reviews (just under 125 when we checked); nonetheless it earns a 3.8-star rating and recommendations from 73 percent of owners.